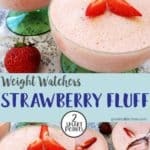 This 2 Smart Point Strawberry Fluff dessert is sweet, fluffy and light. 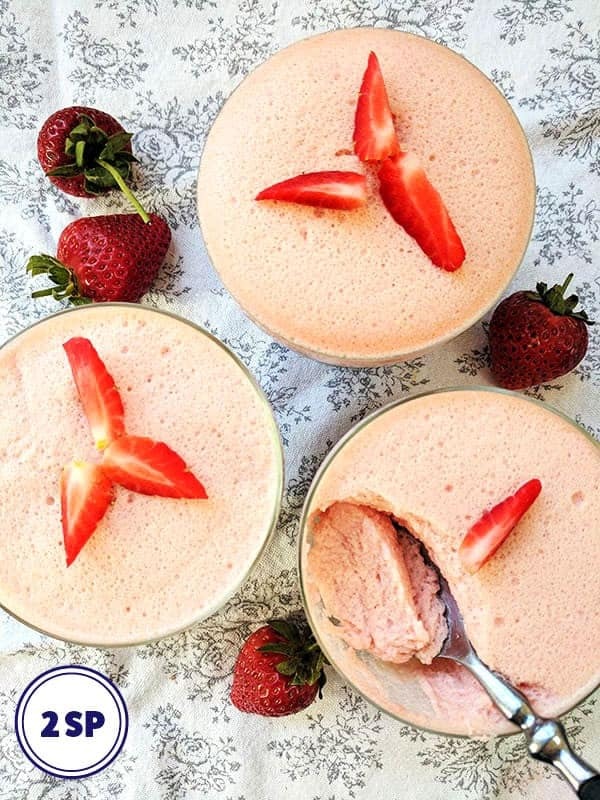 It is made by combining whipped half fat evaporated milk with sugar free strawberry jelly. 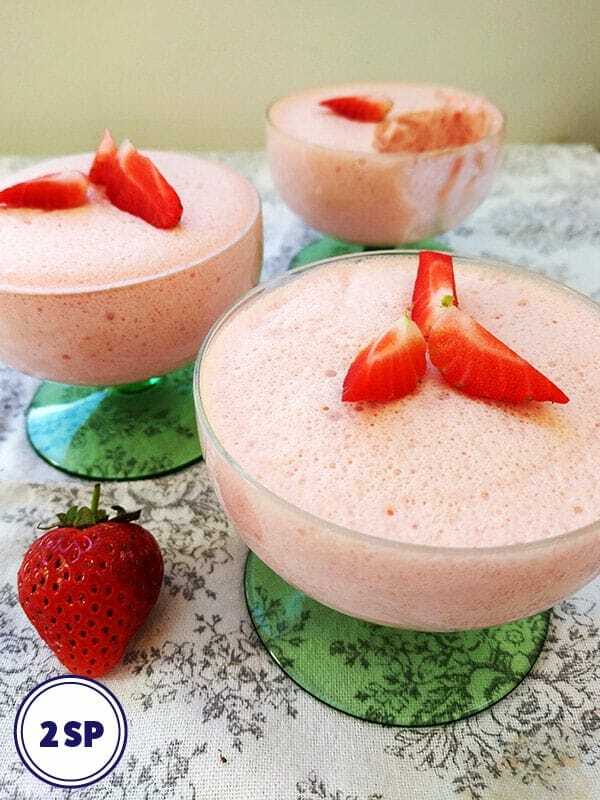 The dessert is then chilled in the fridge for a couple of hours before topping with fresh strawberries. If you are looking for an easy dessert that reminds you of childhood then this is it!! This dessert reminds me of my Gran who used to run a Guest house back in the 1970’s. It was the height of sophistication back then! Of course she used full fat evaporated milk and sugar laden jelly and that would have doubled the Smart Point value. 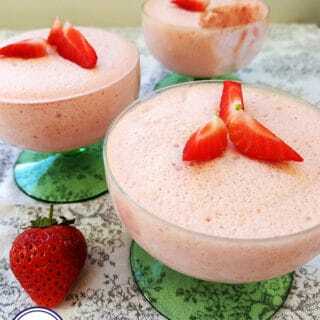 In memory of my Gran, I served these desserts in her glass serving dishes. Light or low fat evaporated milk can be a little difficult to find. Tesco do their own brand of low fat evaporated milk and Carnation do a light evaporated milk but it seems like it is only the bigger shops that stock these. I used Hartley’s Sugar Free Jelly Crystals to make the Jelly but do make sure that you only use half the amount of water suggested on the packet to make the Jelly. 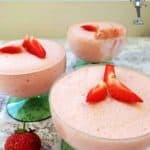 Obviously, you can use any flavour of Jelly that you want to make these fluffy desserts, but my personal favourite is definitely strawberry! Melt the jelly crystals in half the amount of water suggested on the packet and then leave to cool for 20 - 30 minutes. Whisk the evaporated milk in a large bowl until it has tripled in volume. Still whisking, very gradually add the jelly to the milk mixture and continue to whisk for a couple more minutes. Spoon into 6 individual dishes or into 1 large bowl and place in the fridge for at least 2 hours to set. I remember having this as a child, its just as nice now, and at only 2 points it’s a lovely low point dessert.